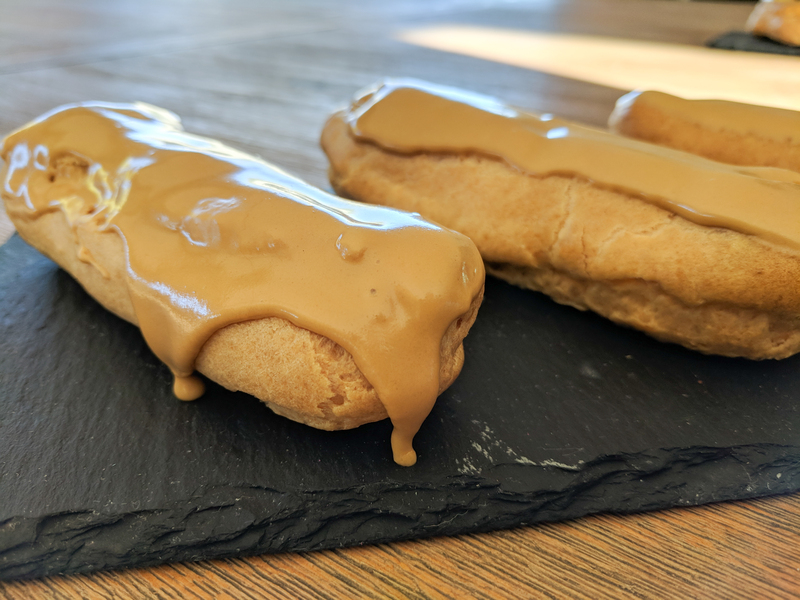 Coffee or Chocolate Cream Eclairs – Delicious and light. Chocolate Eclairs are one of my favourite Pastries from my childhood. Place the butter into a saucepan, add the sugar, salt and water. Bring to the boil allowing the butter to melt before the water boils. Turn down the heat and pour in the flour. Stir throughly and cook slightly until the dough starts to ball together. Remove from the heat and tip into a bowl to allow the dough to cool slightly. Once the dough has cooled enough to touch add the eggs one at time, beating throughly between each addition. After you have add the final egg give a good mix to make sure the batter is smooth. Spoon the batter into a piping bag with a fairly large hole. 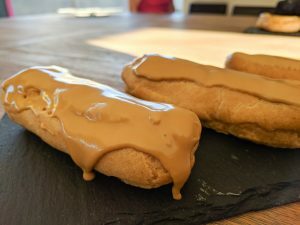 Pipe the eclairs onto a cookie tray lined with paper. They should be 3-4 inches long. Use a wet finger to flatten the tip that forms as you stop piping. You should get 10 eclairs from this amount of batter. Place the cookie tray into a pre heated oven (200C / 400F) and bake for 15 minutes the turn the oven down to 180C / 350F and bake for a further 20 minutes until the eclairs are golden brown and crispy. Remove from the oven and allow to cool completely. Whip the cream till thick and pop into a piping bag ready to fill the eclairs. To make the icing place the powdered sugar into a bowl. Mix the coffee with the hot water and pour half over the powdered sugar. Mix to a paste and add the remaining water 1 teaspoon at a time. you may not need it all. Your Icing should be the consistency of a runny peanut butter. It should coat the back of the spoon and just start to run off very slowly. When the eclairs are completely cool. use a sharp object ( I used a piping nozzle) and poke a small hole each end of the eclair. Poke the icing bag filled with the cream into the hole and gently fill the eclair with cream. turn the eclair around and fill the other side. Next dip the top of the eclair into the prepared icing and give it a little wiggle and then place the eclair onto a serving plate. Fill and ice the remaining eclairs.